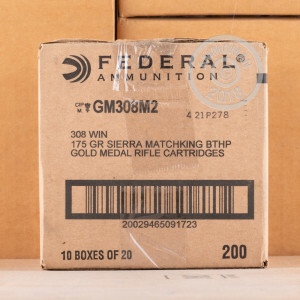 Federal match grade ammo is known for its ability to make single ragged holes in targets in the hands of a skilled sharpshooter. 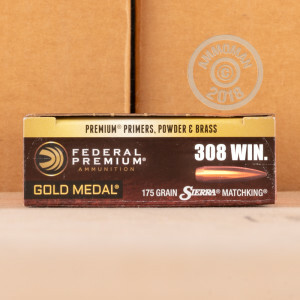 Manufactured to even tighter tolerances than most Federal ammo, these rounds deliver superb accuracy and consistency so that competition shooters' true abilities can shine through and carry them to victory. With Federal Match rounds, your rifle is as accurate as you are! These rounds use Sierra's famous MatchKing bullet, a 175 grain boat tailed hollow point with a distinguished track record in competition. Non-corrosive Boxer primers, high quality propellants, and reloadable brass cases chosen for optimal case thickness and roundness complete the package. This ammo is practically handmade and isn't the cheapest stuff around. 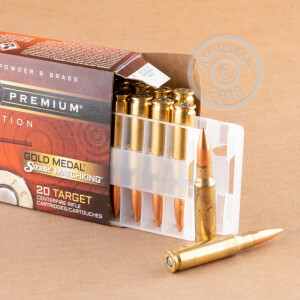 However, if accuracy is not optional for you, this is your load--and the case price for 200 rounds (10 boxes) does lessen the sting on your wallet. These rounds qualify for AmmoMan's free shipping promotion for all orders over $99, saving you even more!